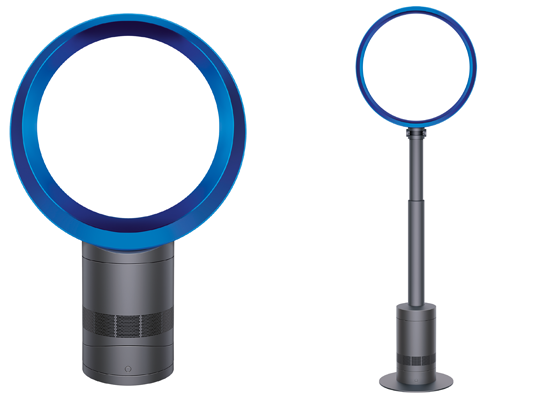 The new Dyson Cool fan is up to 75% quieter, and maintains powerful airflow. Equipped with a remote control and a sleep timer, set one of ten airflow settings, set the time (up to nine hours), and go to sleep as the fan projects air to cool you. 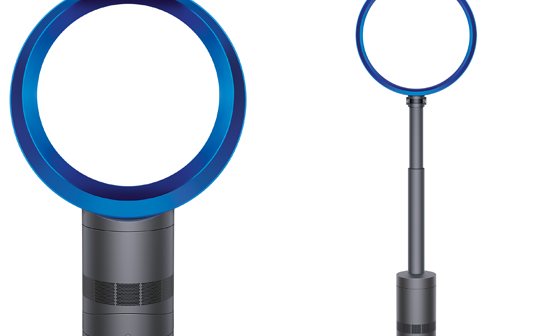 As always, Dyson Cool fans are safe and easy to clean. The Noise Abatement Society has awarded the Quiet Mark to the new Air Multiplier technology. 65 Dyson engineers reduced the turbulence of high velocity air, cancelling out specific tones, yet retaining high performance. Tone – to eliminate tones of 1,000Hz (similar to the frequency of the noise produced by the wing beat of mosquitoes) a Helmholtz cavity in the base of the machine dissipates sound waves. Tamed turbulence – a larger space at the loop amplifier base and reduced airflow obstructions means less turbulence and therefore less noise. Testing – To optimise airflow, complex 3D models are used to map sound. Through a translucent Dyson Cool prototype and a high-speed camera, UV paint was passed through the machine’s loop amplifier to chart airflow. To test the sound quality of the machines, Aero-acoustics engineers arrange 10 microphones in a hemisphere in semi-anechoic chambers. Tough – Destructive, endurance, performance and reliability tests are carried out 24 hours a day, seven days a week at Dyson. Every component is subjected to hundreds of tests and Dyson’s unforgiving test team are tasked with finding fault and weakness. The engineers measure accurate and reliable airflow using a variety of different techniques. When more detail or accuracy is necessary, Dyson engineers use Laser Doppler Anemometry (LDA). This allows them to capture much more detail of the air flow pattern generated by Dyson machines.